A new era is looming on the horizon. The future of Nora is right in front of you. It's up to you to guide your flourishing trading empire into prosperity. Discover flying islands, buy ships and build factories. Invest in prestigious projects and secure their success by passing on secret knowledge to politicians. For even above the clouds there is room for improvement. 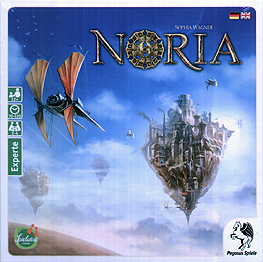 Discover the flying Islands of Noria! Invest in the future of the capital. Experience the innovative Wheel-Building! Build your own Action Selection Wheel. Master the interactive end scoring! Influence your Victory Points through politics.